Interactive lot Maps is website based system developed to inform prospective homebuyers with real time data regarding new home community homesites and area maps. The system is customizable for any real time mapping needs from townhomes and condos to commercial real estate, building layouts or area attraction maps. 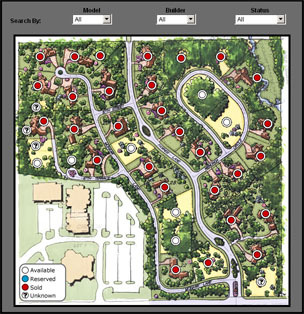 With it's point and click ease of use, Interactive lot Maps has quickly become the new standard for visual communication. The system is 24/7 online updatable ensuring customers have the most up to date and accurate information. With Interactive lot Maps, the changes you make are updated instantly on-line eliminating down time in waiting for a third party to make changes. The content, photos, pricing and information is online updatable 24/7 enabling website access to edit information in minutes. Interactive lot Maps has full MLS/IDX integration built into the system with daily instant updates for pricing, images, details and information. Developed with real estate professionals for the real estate industry in 1999 with ongoing enhancements and upgrades to include the latest technologies and benefits. One-Time design/development setup investment and no ongoing charges.